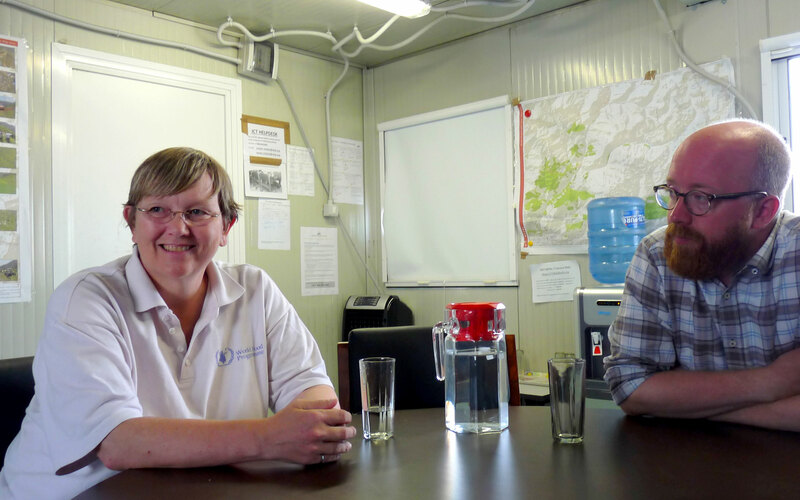 Dorothy Hector and John Myraunet of the UN World Food Programme, on working in Nepal’s remote areas. Q&A. Nearly six months after the earthquake, relief work is still vital for thousands of Nepalis. Hundreds of families are short of food, a cause for grave concern with the winter approaching, particularly for those living in remote areas. 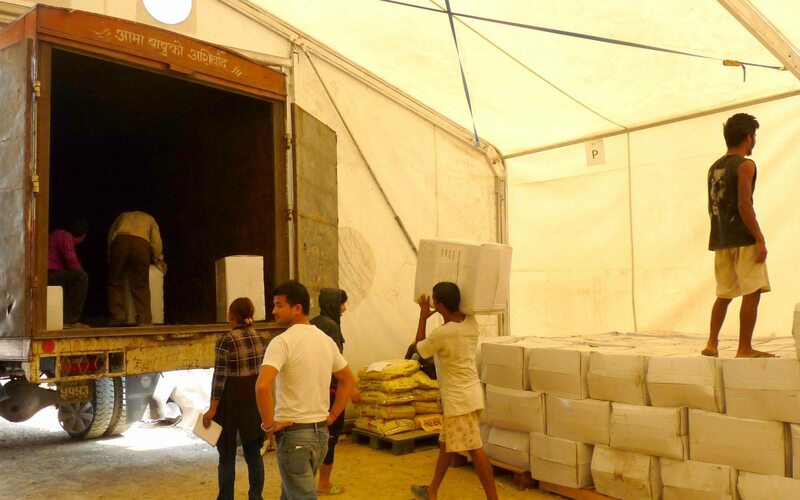 The United Nations’ World Food Programme is the largest humanitarian organisation dedicated to hunger and food security in the world, and has had a strong presence in Nepal since April. A vital aspect of its operations is finding ways to get food to the people who need it most, often across incredibly inhospitable terrain. WFP says it has supplied food to more than 2 million people in earthquake-affected regions of Nepal, using trucks, tractors and helicopters. What are your basic roles at WFP in Nepal? John: Whenever there is a big scale emergency, the WFP activates a cluster system where we take on a leadership role and coordinate with other humanitarian organisations, NGOs, nonprofits and the UN as well as the local government. This structure came about after the 2004 tsunami. So instead of having hundreds of organisations going in at the same time and doing things without coordination, risking unequal distribution of food and wasting food due to profligacy, WFP takes the lead on logistics cluster operations and maximises the geographical spread. In the beginning of an emergency, we get together all the logistics personnel from other humanitarian organisations that are involved in the immediate response to find out the main logistic bottlenecks we are facing. We ask other organisations what their immediate requirement is and then send out help. WFP is mostly the provider of last resort. If there is no other way, we will go in and set up base for all organisations. 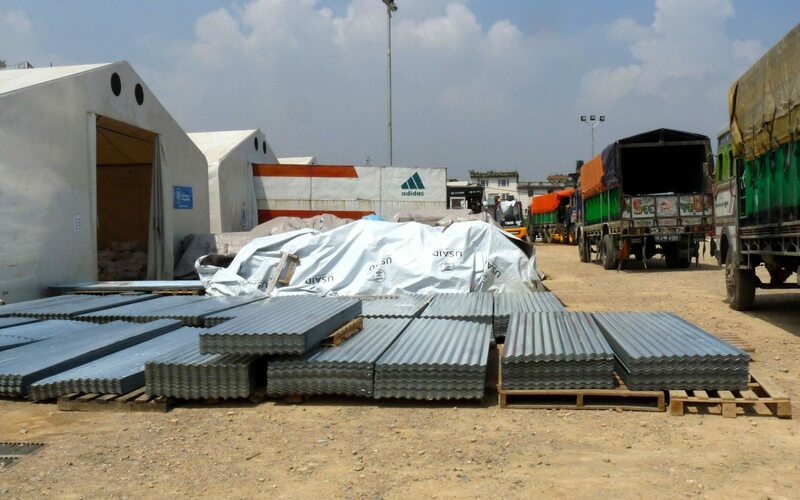 The response action for the delivery of cargo includes bringing in supplies from the airplanes in batches and storing them at the Humanitarian Staging Area, a common storage area for all the different organisations. Dorothy: We came up with the idea of Remote Access Operations to deliver cargo to the farthest villages of the land and to repair trails for transporting cargo. Most people in Nepal live in high mountainous regions. There are no roads and everything is done by trails. After the earthquake, all of the trails were destroyed and the monsoon that came in almost immediately exacerbated the ability of people to move around, as well as to move relief material on ground to the areas that have no access. Helicopters ease the process in such cases, but they are also the most expensive means to do so. We’ve been rebuilding trails all over the country and have been using the expertise of mountaineers who climb Annapurna and Everest. These specialists are very helpful in identifying safety and security issues not only for the humanitarian people involved but also for the locals who live in those areas. We have also gone all the way around using mules, porters and yaks to move the cargo. A lot of pack animals support the high altitude villages and that takes 15 days to deliver from the warehouse all the way up and over a long trek. We recently passed the milestones of 1,000 km of trail and 1,000 tonnes of cargo committed to be moved by RAO. WFP is in its third phase of relief work. Could you explain what that consists of? D: In the third phase of food delivery, there is no longer general delivery in terms of free food. We have started delivering food for work. The communities have to now carry out a few days’ work a month with our partner organisations in the field to receive the food. There are other areas that we’ve assessed where there is no food need necessarily but there is a need for the ability to purchase things and have buying power. So we’re doing a cash-for-work programme in those areas that are closer to the towns and markets. The work that is assigned to people does not require any advanced skill, just the use of basic equipment for cleaning off trails, creating access to local clinics and local water points, doing minor works in the village to make their day-to-day life better. Have there been any frustrations with the relief work that has been coordinated and do you think it could have been handled better? J: Having proper preparedness and investing in preparedness has been a real good lesson to learn from this one. The state of emergency in Nepal has been used as an example at the global level because we had this Humanitarian Staging Area in place before the emergency and that enabled us to start immediately instead of waiting and using a lot of money on flying all the equipment here. Having had this cluster system in place for a while, we see more and more willingness from the different humanitarian acts to work together. So while before it might have been more individually done, now they’re coming together and are sharing information they have with all of the organisations to give a better response together. What kind of cooperation have you had from the government? D: It has been incredible from my experience. John can tell you that in every logistics meeting we have had a government representative. The Ministry of Home Affairs has an office right here and we’ve got a coordinator between the civilian and the humanitarian actors in the military. We’ve got a significant amount of activity and support from them as we are here to help the government of Nepal and not to undermine them in any way. We work with them and we work with their approval in the districts. It’s all about coordinating with them, understanding their needs and making sure that our plans are aligned with what their intentions are so that we are actually acting on their behalf in their areas. There were reports about the suspension of United Nations Humanitarian Air Service due to shortage of funding. Does this issue still exist? J: We have started flying again. A few donors have come forward to say that they will continue funding and also, at the donors’ request, we have introduced a cost component for the helicopters, so the NGOs are paying 20 per cent of the cost of the service. It’s a bit hard to say how this will affect certain organisations and their budgets for their operations because it is still very expensive to fly. D: That’s where Remote Access Operation comes into play because that’s when the porters and the yaks can carry cargo between 30 to 60 kg. It is a lot slower but we can get to most of the locations. There are still places where only helicopters can gain access. We still continue to monitor those areas and advise donors because if there are any trails being repaired by heavy engineering, we would prefer that the areas accessible only by helicopters are given top priority so we can ease the financial burden from those trying to help. Since the earthquake, have you noticed anything peculiar about the way people function on a day-to-day basis? D: We weren’t there during the earthquake so we can’t really compare, but one thing I’ve noticed is that we most often forget that government officials and public servants are also affected by the earthquake. There’s been a lot of demanding from the Prime Minister and the ministers and the local representatives to do different things and sometimes we forget that they are a part of the suffering too and not just the beneficiaries in the remote areas. Some of them lost their homes, family members and yet they’re still doing their job for the country. So we always have to keep that in mind as those of us who come in afterwards, that our beneficiaries are not always just the people that are hungry and have lost their homes and fields but also the actual people that we’re working with. What are the challenges that lie ahead? D: Winter is coming… and nothing that we do is going to change that. We need to ensure that we are planning for it and that we’re doing everything in our power to make sure that we deliver as much as we possibly can. By doing so we will be prepared when the snow falls, especially in the remote areas. People need to be able to access food, stores and shelter that we were able to preposition for them so that the winter isn’t going to be as hard as it could be. That’s what we’re most concerned about today and we are working very hard to ensure that we beat the snow. There have been reports of another quake that is going to hit Nepal. What are the steps that the organisation is taking to be ready to face it? J: In a place like Nepal which faces danger of a recurring threat, maintaining a structure like the HSA is something that we will continue doing and that will go into next year. We will also be working very closely with the government to assist them. We will be focusing on building the government’s capacity on emergency response, having equipment, staff that is trained and having processes and procedures in place so that we’re better prepared to respond to emergencies. What future do you see for Nepal’s recovery? D: One of the bigger issues in Nepal is infrastructure because logistics uses infrastructure like roads, bridges, trails in order to solve problems. Given the effect of the monsoon post the earthquakes, infrastructure is most damaged and as an engineer I’m going to say that it’s going to take a long time to repair everything. People are repairing the road to China, the road to Sindupalchok and once the rain stops they’re planning to do some major work on the tourist trails so there’s going to be enough work for quite a long time. At the end of the day we need to keep in mind that this is an earthquake zone so you repair something and you might have to come back and do it again. It’s all about the infrastructure. J: Through the logistic cluster we also have a specific working group looking at access and infrastructure to map out the key bottlenecks and identify if anybody has any projects to open those roads and trails. D: We had planned to work on a trail in Gorkha only to find out that the monks in the monasteries had already done it. Yesterday, talking to another group we found out that the locals have fixed a major trail that goes through the district we had planned to fix. There is an abundance of wealth of information as well as people willing to do things for themselves and their resilience is incredible. I see the resilience of the people that live in the remote areas and they are an incredible group of people. They know what their lifelines are so they get out there and they’re helping themselves every day. It’s really heart-warming to watch them rebuild their country.